The city of Jaipur reflects a clever amalgamation of the Rajput and Mughal styles, which has given this city a unique character. Being close to Delhi and Agra, and the fact that its rulers were powerful members of the Mughal durbar (court), ensured that its rulers kept the special Mughal touches of filigreeing marble and sandstone alive. Fresco painting and inlaid mirror work has also been used extensively to create a fantasy world of color and richness in the midst of bleak surroundings. This love for decoration was not confined to the royal houses but filtered down to the common man as well. This is apparent when one takes a walk down the broad streets of this delightful city. 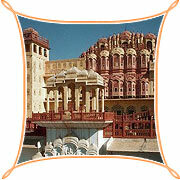 Hawa Mahal is an enchanting monument built centuaries ago and a believe me! a trip to Jaipur is not finished if you don't explore this part of it. The Hawa Mahal, or the "Palace of Wind" built by Maharaja Sawai Pratap Singh in 1799 A.D. is characterised by elaborate and fanciful architecture. The broad pyramidical facade comprises five storeys of semi octagonal overhanging windows with perforated screens, domes and spires. Built in 1799, by Maharaja Sawai Pratap Singh the 'Hawa Mahal', Palace of the Wind, is one of the major landmarks of Jaipur. The entrance to Hawa Mahal is from the City Palace side, through a stately door which opens into a spacious courtyard. The courtyard has a double storeyed building on three sides. There is a small archeological museum here. Only the eastern wing has three more storeys above, which are just a single room thick. The building, standing on a high podium, is a fifty-foot high thin shield, less than a foot in thickness, with small intimate chambers , which give this palace its unique facade. There are no regular stairs to reach the upper floors, but only ramps. Hawa Mahal which is currently under the supervision of the State archeological department provides the visitor with excellent views of the city. 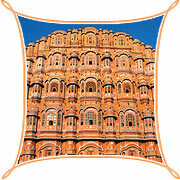 The best time to view Hawa Mahal is sunrise when sunlight through the latticed windows gives it a wonderful glow.